Smoked Sardines, Sunflower Seed Oil, and Salt. That's all those crazy Latvians put in these Adro smoked sardines. Round can, no pull top, holding 6 nice fish layered over 3 more. As soon as I opened it, it smelled great. Really pretty fish, good smokey flavor, a bit of a Salty finish. Salt is definitely a by-product of smoking. 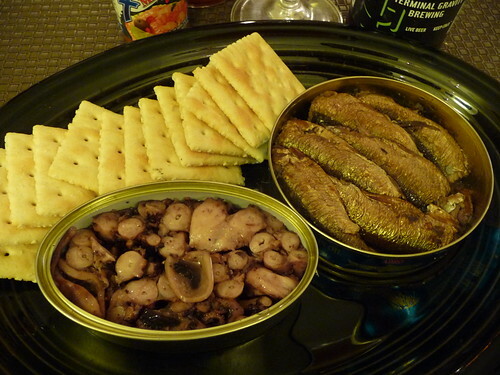 So is eating sardines. This 7 Mares hot sauce claims to be fish specific and it's going great with these sardines. No saltines though, enough going on here. GG grabbed the water crackers. If you were having a fiesta, this would compliment your usual canned sardine selection nicely. 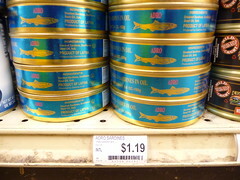 Three and a half tins for the fish, 1/2 tin for the pretty fish and packaging. Four out of Five tins. 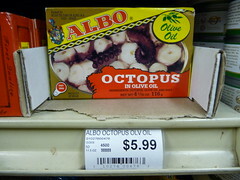 Don't tell anyone, Albo Octopus in Olive Oil. Product of Spain. Really Good, very exciting, I love me some pulpo. Good flavor (a bit like the tinned sardine at first, then the pulpo comes in strong), good texture. Red Devil. I'm going to stock six of these in the earthquake kit, when I put one together, someday. Four out of Five tins. Terminal Gravity. Bottle 3. Didja get me a case yet. Beer can keep for quite awhile in a cellar away from the sun.